Markets are where Shanghai people spend most time and money. 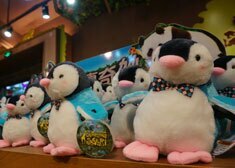 They are places where visitors can see the real local life of Shanghai and also places that offer a variety of rarely-seen products. The only downside is that everyone at the markets speaks either local dialect or Mandarin. If you wish to explore these markets, just contact us for an English-speaking local guide and a private car. This 20-year-old snack shop is a childhood memory for thousands of Shanghai people. Biscuits and milk from the shop are the favorite breakfast food of myriads of locals. At the beginning of the 21st century, not so many youngsters went to the shop, because they thought it was out of date; but in recent years, more and more children have been going there to replicate their parent’s memories. That’s the most pleasant thing to the shop-owner. Chocolate, sugar plums and coconut balls in the Danchang Candy Shop are all favorites with local people. Although the taste of the candies hasn’t changed, today’s children love them just as yesterday’s used to. 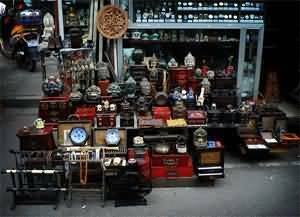 The Treasure Tower is one of the largest antique markets in China. Antique businessmen from all around China try their luck in the tower. Not all antiques there are authentic, though the 300 vendors in the tower will try their best to make customers believe they are. We recommend that tourists who are not knowledgeable about Chinese antiques should not buy anything in the tower, unless they think it’s really cheap. This is a luxury jewelry and curio market. Jade, teapots, wood carvings, furniture, and jewelry, from both China and Europe, can be found here. 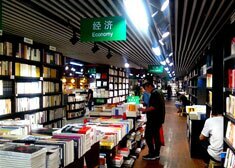 Besides, the favorites in the market to many foreign tourists are the traditional Chinese painting and calligraphy shops. Prices of the masterpieces there can easily exceed 10,000 RMB (1,538 US dollars). Check Local Shanghai Products out! Japanese sea pearls are the star product in Pearl City. All the shops will ask much more than the real value of the products. You have to bargain. Sometimes, it’s ok to ask for as much as 50% discount. To most people’s surprise, the salespeople in Pearl City speak very good English. They are willing to redesign pearl accessories according to customers’ requirements. Customers are also welcome to select pearls and string them together to make their own accessories. Founded in 1906, Laomiao Jewelry has been one of the best jewelry shops in China for over 100 years. The most fashionable jewelry, gold or silver items and crafts, in China can be found here. Lots of new couples buy their wedding rings at Laomiao. Besides, the shop also sells exquisite gold vessels, favorite birthday presents for people senior in age. With a history of over 160 years, Laofengxiang Jewelers have set up over 40 shops in 30 cities in China. 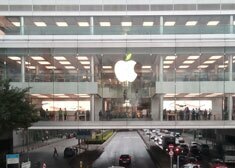 Their flagship shop is on Meilong Road. All the service staff wear black uniforms and white gloves. Their professionalism is reflected in their attitude. Most customers are not so knowledgeable about jewelry, but members of staff never express impatience. That is why so many local people buy jewelry in Laofengxiang, even though it is more expensive than most other jewelers in Shanghai. Shanghai South Bund Fabric Market, as the name might suggest, is the ultimate stop for buying fabric. It was opened on April 15, 2006. Three air-conditioned stalls offer a wide range of silk and fabric. The market has all of Shanghai&apos;s best tailors under the same roof. Wade through the mountains of fabric perfect for a design of your own creation or for the numerous samples on show. This is a perfect place for the person who enjoys sewing or wants to have beautiful clothes or home accessories custom-made. Remember: bargain hard for a fair price. Renowned for high quality and different varieties of silk, and for professional service, the Silk King is the first choice for local people who want to buy silk products. Cheongsam, scarves and handkerchiefs are the premier products in the Silk King. This is a top shopping destination during weekends. 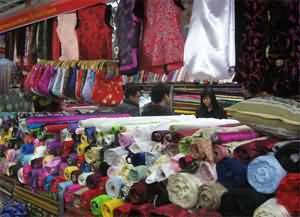 Thousands of foreign tourists go to the market not only to buy silk but also to observe local culture. It is interesting to watch and listen to Chinese people bargaining and talking in the Shanghai dialect. More than 10 costume wholesale markets are located in the mansions along this 680-meter-long street. Almost all brands and patterns of costume can be found here, but there are also fakes masquerading as the real thing. Customers are recommended to bargain first. If shop owners accept a discount of up to 50%, the products are definitely not authentic. For most international tourists, the street is a tourist attraction more than a shopping destination, for it has prospered with the costume trade for over 3 decades. It is now a great place for learning about local commercial culture. The small restaurants and milk-tea shops on the street provide a comfortable context from which tourists can study the culture. There are over 120 tea shops in this square. Lots of the shop-owners also grow tea in their hometowns, so there is no need to doubt their professionalism. They never push customers to buy, but they all have returning customers, because they treat selling tea as an opportunity to make new friends. Customers can taste tea for free and owners will introduce the tea and how to drink it to customers. Most customers will learn to like both the tea and the owners during this introduction. This market is not very large, but the variety and quality of tea are both satisfactory. Tea sets are a special feature of the market. 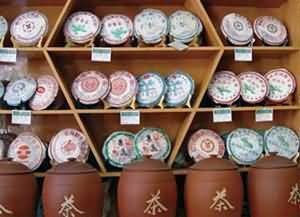 The interesting culture of tea can be learnt from tea sets. Customers will learn about tea culture as shop owners introduce tea sets. Often, it takes more than half an hour to make tea, but only 1 minute to drink it. That’s the Chinese tea culture. Tianshan Tea Market has three floors in total. It is also a good place for learning about tea culture. Shop keepers like to introduce different kinds of tea to customers and you will have an opportunity to try some of your favorites. The tea price varies according to quality and brand; these should be checked carefully before purchase.